The B-17 'Memphis Belle' Is Being Restored At The Air Force Museum At the Air Force museum in Dayton, technicians and volunteers are working to restore a unique piece of history. The B-17 bomber Memphis Belle is being carefully returned to its wartime appearance. Technicians work to restore the B-17 bomber known as Memphis Belle at the National Museum of the United States Air Force near Dayton, Ohio. A legendary airplane that helped America win World War II is being reborn at age 75. The B-17 bomber "Memphis Belle" flew 25 missions against Nazi Germany and then came home to help sell war bonds and raise spirits. 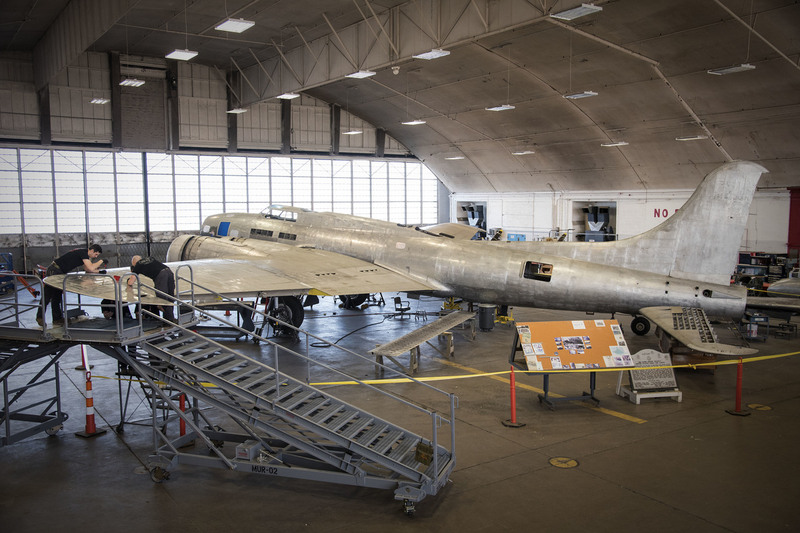 In recent years, the Belle has been undergoing a patient and precise restoration at the National Museum of the Air Force Museum near Dayton, Ohio. I went to see the work in progress and talk with some of the many technicians and volunteers. The restoration hangar is a vast, bright workspace, where the four-engine Flying Fortress has been stripped down to its bare aluminum. After eight years work the plane is still to be painted. Richard Issacks was a B-52 pilot in Vietnam and then flew for American Airlines. 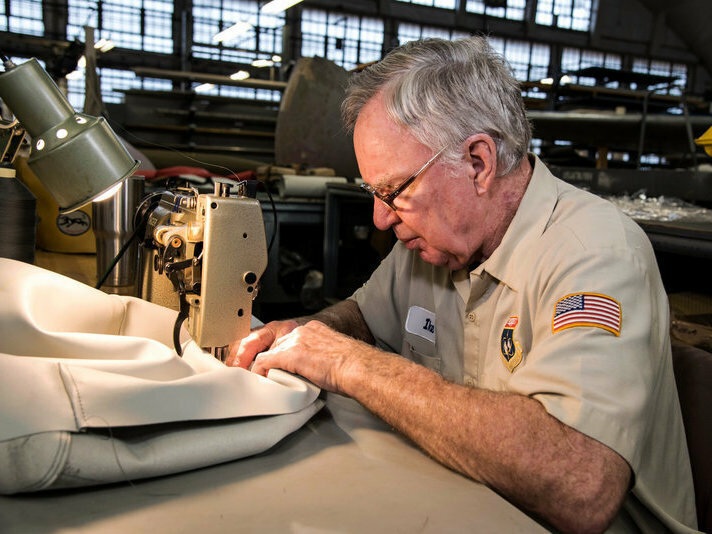 Here, he works on a cushion. This is the actual aircraft that I have watched in a documentary from 1944. William Wyler, the Academy Award winning director, went to an Army Air Force base in England, and he and his team could take their cameras on the bombing runs — riding with the pilots, the gunners, the bombardier, navigator. The plane was built in the summer of 1942 by Boeing in Seattle, and flew from Bangor, Maine, by way of Scotland, then on to an Army Force Base in England. A 10-man crew was put together, the youngest was 19. Captain Robert Morgan, the pilot, named the plane after his girl friend. They started flying missions in November 1942, dropping bombs on targets in France, Belgium and across into Germany: aircraft factories, munitions plants and submarine bases. Once, the Belle went out with 27 other planes, and six failed to return. For the men flying mission from England, the Army Air Force had set a goal: "Fly 25 missions and we'll send you home." The Memphis Belle crew accomplished that and then flew back across the Atlantic to celebrate. They landed at 31 American cities, cheered by big crowds at war bond rallies. The plane went on display in Tennessee, honored and protected for many years, neglected for many others. And in 2005 it was sent by truckloads to the Air Force Museum outside Dayton. Restoration has been underway, helped now by extra film from the Wyler wartime documentary. Lead Curator Jeff Duford is able to watch on his computer screen more than 11 hours of Technicolor outtakes. "I can't think of any other event or restoration where we have this much color footage," he says. "It was as if somebody knew that we would need this. And one of those cameramen, Harold Tannenbaum, was killed flying on a photo mission." 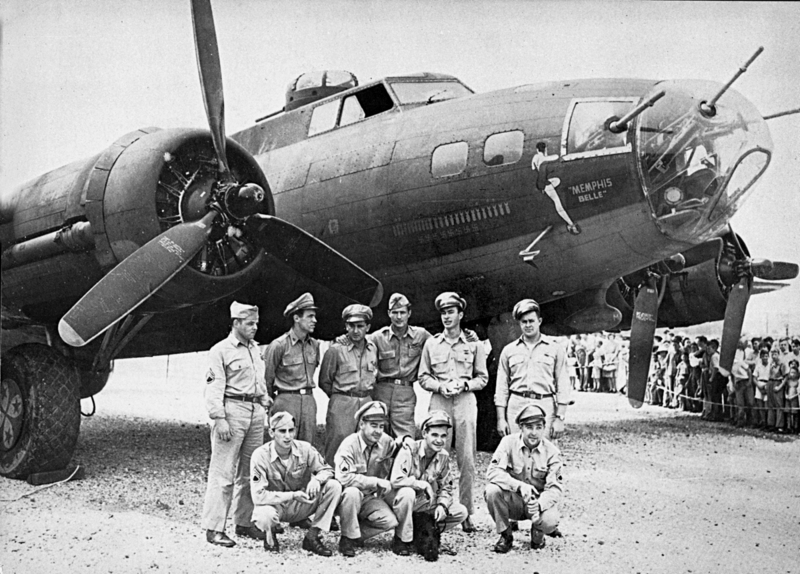 The crew of the Memphis Belle, a Flying Fortress B-17F, poses in front of their plane in 1943, in Asheville, N.C.
Steve Markman, a retired aerospace engineer, is one of many skilled volunteers donating their time and experience to help the museum's aircraft mechanics. On his bench one day, a Norden bombsight: "Top secret during World War II," he says. "It's got about 70 years worth of dust on it." He's using some alcohol and scrubbing pads and a toothbrush to very gently remove that grime. The Memphis Belle, fully restored (although not for actual flight) is scheduled to go on display May 17, 2018. That date marks the planes 25th successful mission back in 1943. But there's still lots of work left. The restoration team estimates they still have 12,000 hours of work ahead.